1. The Italian town of Massarossa wants cars off the road so much, they will literally pay residents to bike to work. The town plans a 12-month pilot focusing on 50 workers. Each will be paid 25 cents per kilometre, tracked via a smartphone app, up to a monthly cap of 50 euros ($72). That doesn't sound like much, but it would amount to maximum annual savings of around $860, not to mention factoring in the money saved on gas. Do you think this sounds like a good idea? 2. Something was attempted in France last year, and while the numbers of cyclists did increase, most of them had been either carpooling or taking public transit anyway, so the total number of cars on the road didn't go down by much. Paris banned most cars for a single day in September in an attempt to combat pollution. Do you think something like this would be a benefit to your city or town? 3. 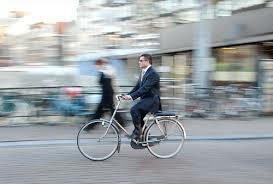 Do you bike to work or school on a regular basis, or would you like to? I can't even consider biking to work/school for a number of reasons -- too far, highway driving, unsafe terrain, etc. 4. By 2019, one European capital city plans to be completely car-free. A newly-elected city council in Oslo, Norway, made the landmark decision to restrict all private vehicles from the capital's centre, marking the first permanent ban of this kind. Oslo's city council is comprised of Norway's Labour, Green, and Socialist Left parties – all of which intend to construct 60 km of extra bike lanes in the interim, while allocating more funds to the city's public transport system. Do you ever see this happening in Canada or the U.S.?